-	BMP: Go ahead and click Print to BMP and a BMP Image document will be generated in a new browsing window where you can View, Save or Print it. -	PDF: Go ahead and click Print to PDF and a PDF document will be generated and you will be redirected to that document where you can print it or save it. Send a copy to your File Cabinet if you want to maintain copies of your plans for historical purposes. Send a copy to your Print Cart if you are compiling a series of documents you want to print all at once and compile into one singular PDF document. -	HTML: Go ahead and click Print to HTML and a new browser window will appear with just your stacking plan. 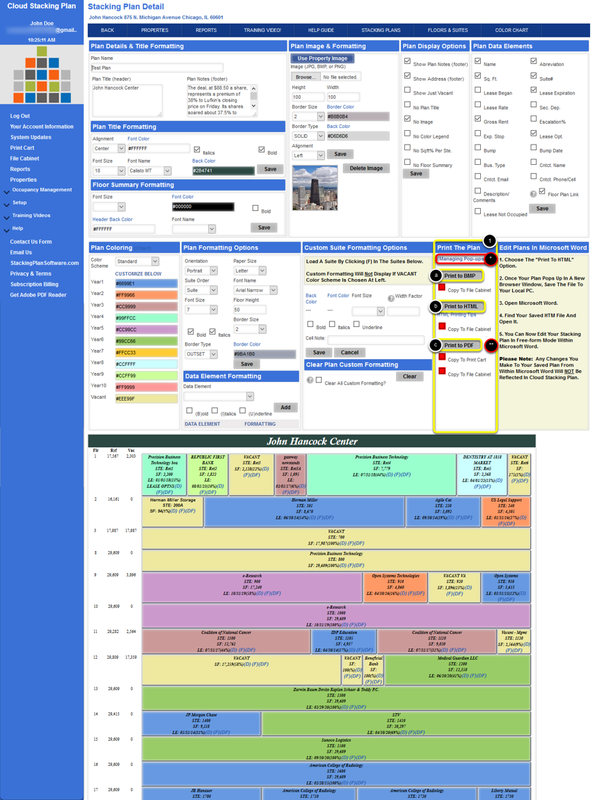 From within this new web page, you can print the page or choose print-preview where you can manage the layout of your stacking plan from within print options, such as "fit to page", page margins, etc. You can also turn on/off browser standard headers and footers, page numbers, etc. With HTML, you can also place a copy of your stacking plan in your print cart that lists an HTTP link to the plan file in the case you want to provide a link to your stacking plan so it can be accessed on the internet. Use this link within your webpage, email it to colleagues, etc. When it is clicked on, the page will load and they will see your stacking plan. Please Note: Printing your stacking plans requires that your browser has pop-ups enabled for this site. Ensure you have managed your browsers pop-up settings. Click here for more information. Please Note: Regarding PDF printing, your pc is required to have a pdf reader such as Adobe Reader. Click here to get the latest version. * Please Note: Printing your stacking plans requires that your browser has pop-ups enabled for this site. Ensure you have managed your browsers pop-up settings. Click here for more information. ** Checkmark the box Copy to File Cabinet (under your print option selection) if you want to maintain copies of your plans for historical purposes. Checkmark the box Copy to Print Cart (under the PDF print option selection) if you are compiling a series of documents you want to print all at once and compile into one singular PDF document.